The classic and creative design of the Hacienda de Palmas is the perfect place to unwind after a day of sightseeing or sport-fishing. The beautiful interior courtyard is your own private garden. Inside the Hacienda de Palmas, the central reception area has a big screen cable TV, game tables, free long distance to the U.S. and wireless internet. 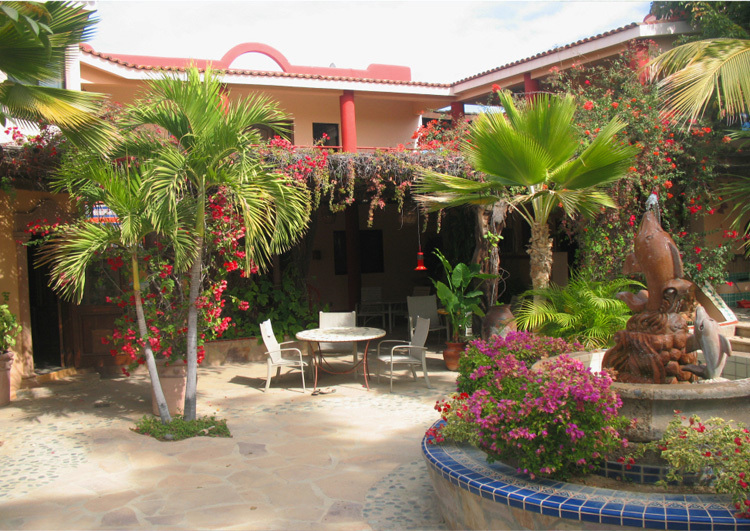 The Hacienda de Palmas has 5 rooms available. The rooms are spacious and clean, with individual style and decor. Most of the rooms are located on the second floor. For larger groups, the entire hacienda can be rented, and meals can be specifically catered to your needs. Depending on vacancy, single rooms are available at nightly and weekly rates.